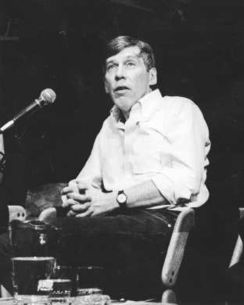 Thomas Babe (1941 – 2000) was an American playwright, “one of Joseph Papp’s most prolific resident playwrights at the New York Shakespeare Festival,” with seven of his plays premiered at the Public Theater. His work during the mid-1970s and through the 1980s explored many elements of American history and cultural mythology. He was fascinated by the concept of the traditional hero figure and the reality behind it. Although he started writing at a young age, Babe did not go into theatre until after earning other degrees at Harvard University, where he was Phi Beta Kappa; Cambridge, and Yale University Law School. Babe’s works were regularly produced in New York City by Joseph Papp’s Public Theater, as well as by regional theaters across the country. Papp produced a series of his plays in the 1970s and 1980s, including REBEL WOMEN (about the Civil War), TAKEN IN MARRIAGE with Meryl Streep, Colleen Dewhurst, Kathleen Quinlan, Elizabeth Wilson, and Ms. Carter; and BURIED INSIDE EXTRA, a newspaper drama starring Hal Holbrook and Sandy Dennis.